Out of the blue, while in the changing room prior to our hockey game, Apu pipes up about a new Neapolitan pizza joint. 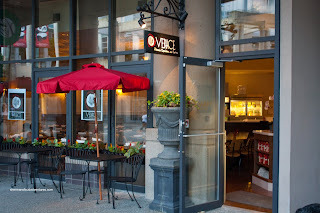 Apparently his wife had visited Verace Pizzeria and the feedback was positive. Furthermore, their whole menu was 15% for the month of July. There were several attempts to visit the place; but due to our late games, we never made it out there. I even tried with our softball team; yet we were never really all that close by. It looked pretty grim as the days in July were dwindling. Finally, after our game at Montgomery Park, I made it a point to head over there. “Over there” was right next to the T&T Supermarket near the Stadium Skytrain Stadium. Hence, parking is a little bit scare. Consequently, I volunteered to carpool everyone. Not sure if it was Karma or just plain luck, I got the closest parking spot possible within a stone’s throw to the front door. And about that front door... It’s not very flashy. It can easily be missed, especially located in a roundabout hidden from the main street. Bear was surprised by the classy decor and the overall style of the restaurant. 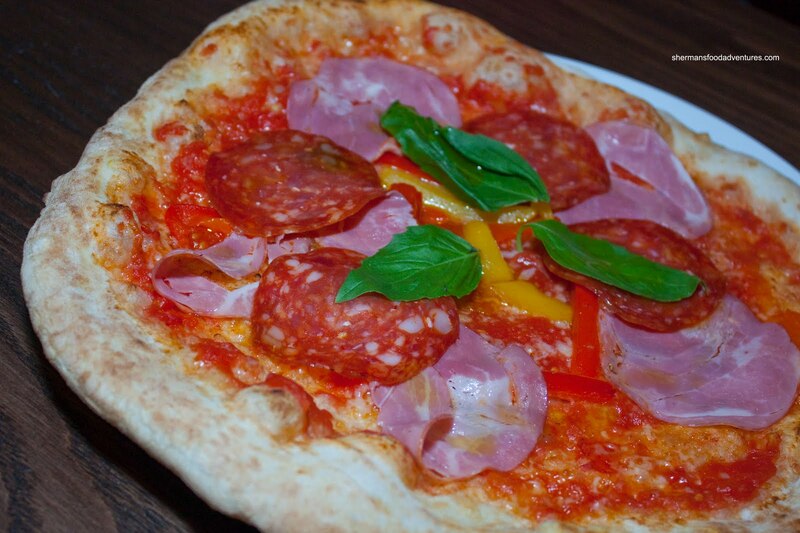 He didn’t expect an authentic Neapolitan pizzeria in this neighbourhood. W ell, I wasn’t. So many great places to eat have opened up shop in the most unsual places (see: Acme Cafe, Campagnolo, 2 Chefs & a Table among others). 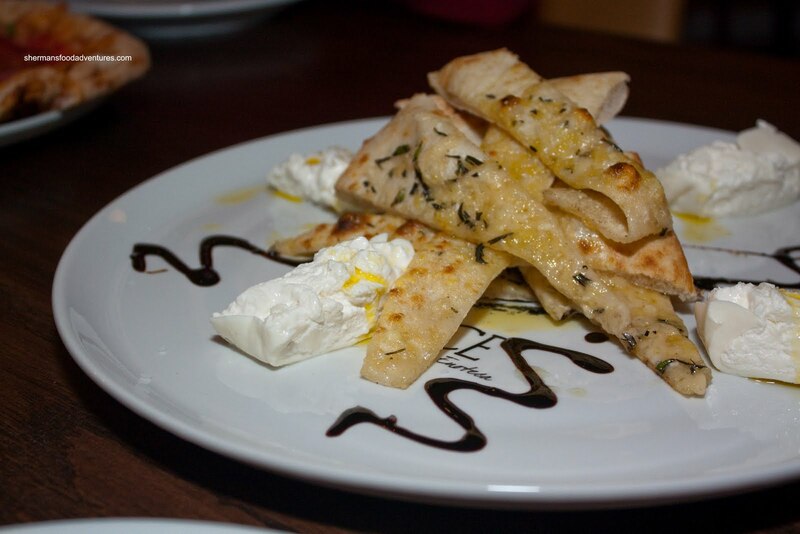 We decided to share a few things starting with the Burrata complimented by pizza bread and a balasmic reduction. Although I still have fond memories of the Burrata I had at L’Osteria del Forno in San Francisco, the one here was pretty solid. Each piece of Burrata was smooth and buttery. 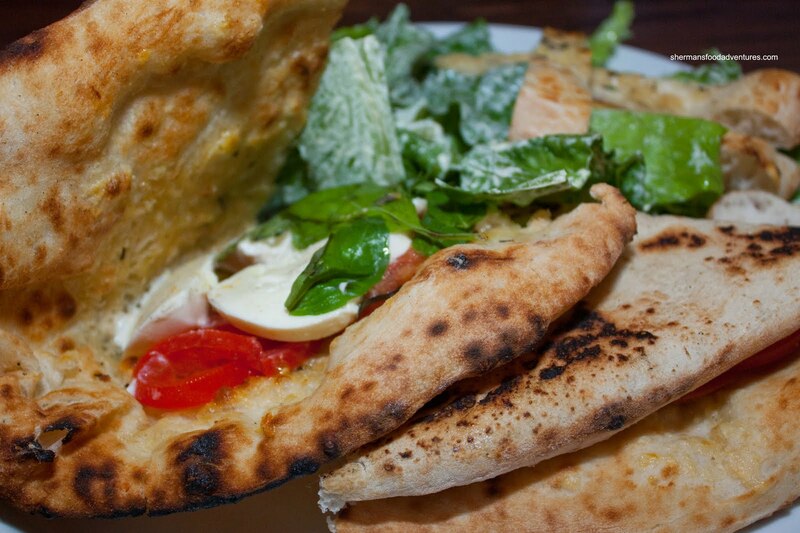 Surprisingly, the pizza bread almost stole the show. It was crispy, chewy, flavourful and worked well with the Burrata. 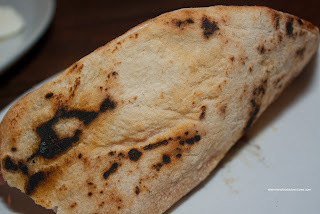 I liked how the balsamic added some acidity and sweetness as well. 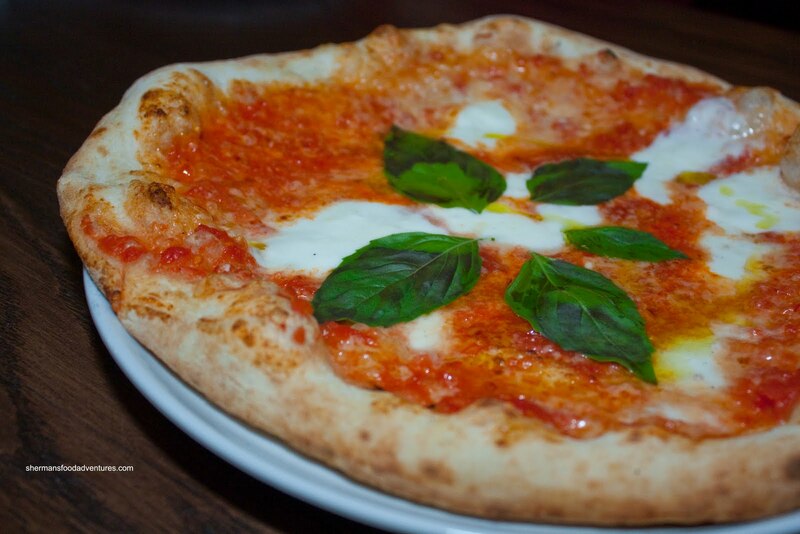 Of course, no visit to an authentic Neapolitan pizza joint would be complete without trying the Margherita. In this case, we had the Verace Margherita DOP which consists of San Marzano Tomatoes, Buffalo Mozzarella and fresh basil. When it arrived, it sure looked good. Reminded me of the one I had at Nicli Antica. The outer crust was pretty good – chewy and charred (or what they call leoparding). At the centre, it was soft, which is normal; but slightly wet. Not as wet as the one I had at The BiBo; but wetter than the one at Nicli Antica. In terms of flavour, the San Marzano T omatoes were money. So flavourful from the natural sweetness and acidity, the pizza would’ve succeeded on that alone. Of course the cheese was subtle along with the fresh taste of basil. A solid pizza. As a comparison, we also had a more substantial pizza in the Diavola which was comprised of peppers, cappicola and salami. This particular pizza was naturally more flavourful due to the various meats and sweet peppers. Nice mix of sweetness and some spice from the capicolla. This one was actually less wet in the middle, which we preferred. Moving away from the regular pizzas, we decided to also try the Peppe Calzone. 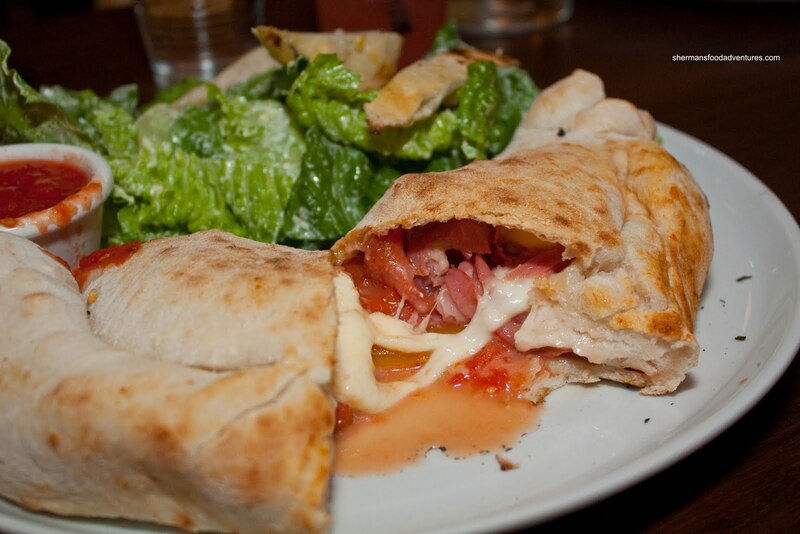 As expected, it was essentially what it represents – a pizza folded over to create a Calzone. So the dough was still the same being chewy slightly charred. There was no shortage of ingredients which may have contributed to it being a little wet as well. To be fair, we cut it apart into 4 sections which is usually the way it was meant to be eaten. So all the juices spilled out. Judes decided to go for the Caprese Sandwich which was almost like our Calzone, except it was not sealed. She liked it. Although, for me, it looked like a lot of dough and indeed she couldn't finish it. In my opinion, I'd stick with the pizzas over ordering a "sandwich". The accompanying Caesar was much like the one we got with the calzone. It was crisp and fresh; however, it was a tad underdressed. The dressing was good, we just didn't get enough of it. 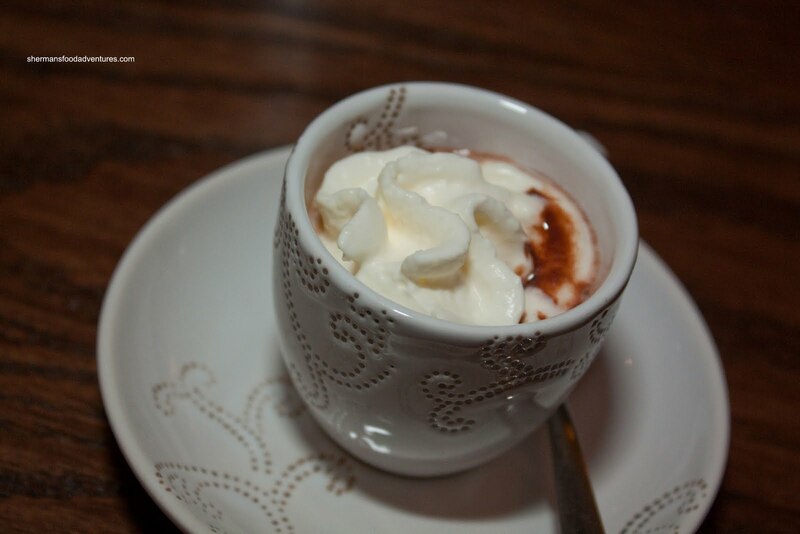 After our meal, we were presented with complimentary Hot Chocolate. This was a good hot chocolate. Not sweet at all with dark chocolate richness (and slight bitterness), this was a small little treat. By now, all of us were on carb overload and I could feel the dough really settling in my stomach. However, that didn't stop some of us from trying some dessert. Bear originally wanted some cheesecake. Too bad it was all sold out. 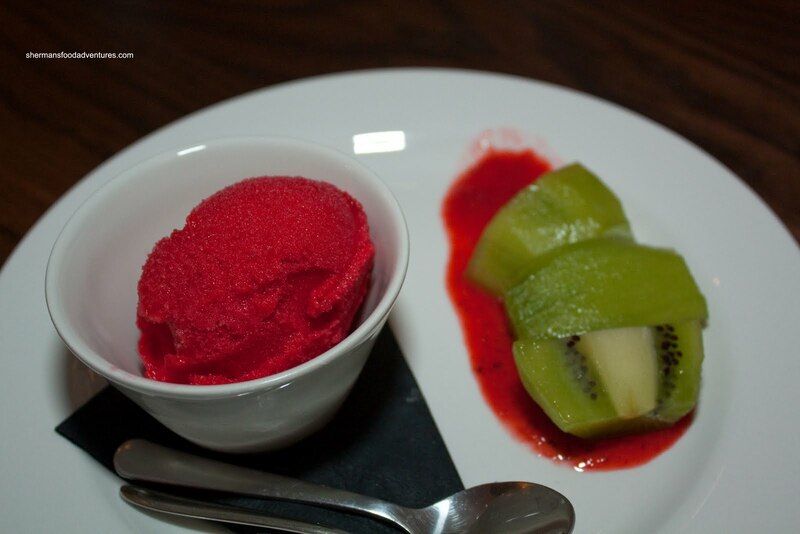 He settled on a scoop of Sorbetto which was refreshing. I got to steal the kiwi fruit from his plate, he didn't want it. In fact, the dessert I settled on sharing with Milhouse, he couldn't have any due to the lemon (which upsets his stomach I think). The Lemoncello Layer Cake was the only thing that stood out on the dessert menu. 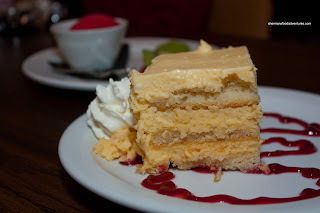 The description - Lemoncello-soaked lady fingers layered with lemon curd - sounded so good! Well, it was really good. The Lemoncello was very apparent in the ladyfingers which afforded a sweet citrus zing. The fresh lemon curd added another hit of tang which put the whole thing over the top. Where some desserts advertise lemon and the result is flat, this one makes up for all of them. The only thing we would've liked to see was a smoother curd. Some further investigation and we found out their pastry chef had worked for Thomas Haas. Interesting. In fact, the whole meal was quite interesting in itself. The pizza definitely reminded me of Nicli Antica and The BiBo. If I had to rate it, Verace slots in between the 2. That is a compliment, for those keeping track. For a place that has just opened, that is not bad. The only concern I have for them is that some people may not understand the regular pricing. The type of pizza they are serving is not remotely related to Uncle Fatih's around the corner (although I love Uncle Fatih's! ), so there is some justification for the higher prices. 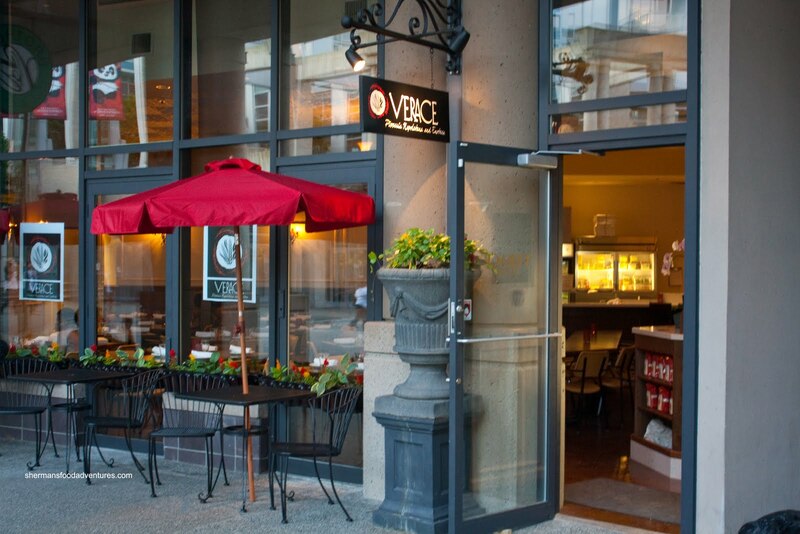 We ultimately enjoyed our meals and thought we got good value at the discounted price we paid. Lemoncello Layer Cake looked good.. but at $9.50 it stings. @FMF It was worth it though!